Hot dog carts and specialty mobile food vending carts. Full custom hot dog carts and vending carts. 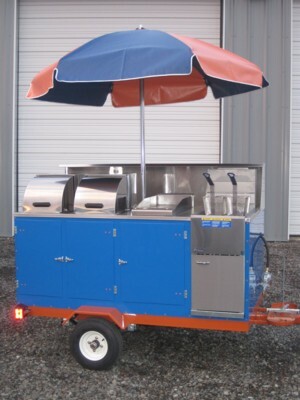 We build hot dog carts, taco carts, ice cream carts, shave ice carts, fryer carts and more. Pictures of our custom hot dog carts and other food carts. 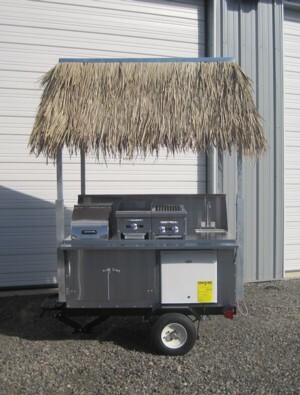 Hot dog carts custom built on towable trailers or push cart style. Dozens of custom choices, so each cart is unique! The Wee Weenie is the perfect entry level hot dog cart. Small, easily movable push cart, with a full size steamer and hand-washing sink. Shave ice and sno-cones have the biggest profit margin! This cart has interior storage, hand-washing sink, plenty of counter-top space and can built on a towable trailer or as a push cart. The Starter Hot Dog Cart offers twice the cooking capacity as the Wee Weenie, while remaining affordable. 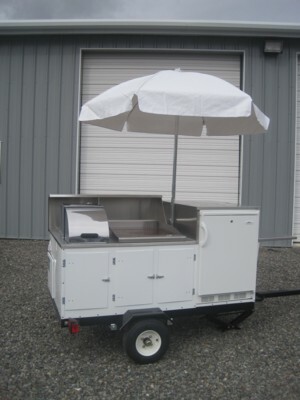 Built on a towable trailer or as a push cart, this hot dog cart is easily movable. 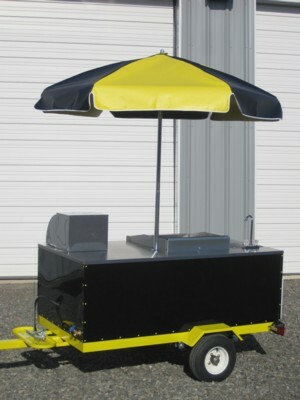 Designed for city streets, this 3 foot by 5 foot hot dog cart is perfect for downtown and business district locations. 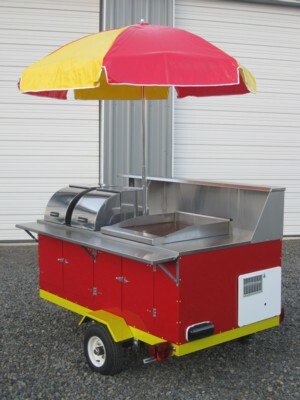 Specially designed for Seattle, this hot dog cart is 3 feet wide by 5 feet long and comes standard with a refrigerator, dual steamers, and hand-washing sink. The Classic Taco Cart has everything you need in the perfect size package. This cart is equipped to turn out good food at a quick pace. Featuring dual steamers, a commercial flat griddle, and on-demand water system, this cart is ready to Rock Your Competition! One of the most versatile carts in our standard model line-up. Double the cooking power with this Fryer Cart! Designed to meet the new requirements for California, this hot dog cart features a large on-board refrigerator, 3 cu ft of dry storage, dual steamers and a hand-washing sink. The Oregon Class IV Cart can accomodate unlimited menu options, with the on-board ware-washing sink, extra large water tanks, and on-board refrigerator. While many of our hot dog carts are fully versatile and have the cooking equipment to function as a Taco Cart, this cart has earned its name as the Ultimate Taco Cart! Jaw dropping awesomeness! Full custom ice cream cart with under-counter freezer, water system and fabric awning. The easiest vending cart business to start! All you need is a peddlers license and a Sunglass Cart package, and you're ready for business! Features and available upgrades on our hot dog carts and food carts. Contact us if you have questions, to place an order, or to request additional information about our hot dog carts and specialty vending carts. To order your hot dog cart or vending cart call 503 269 7519, or download and complete an order form. View our frequently asked questions page or contact us wth any questions you may have. This page contains links to other website relating to hot dog carts, vending carts, health regulations, etc.